The last flight of any aircraft must be a sentimental event. When that craft is the last shuttle to fly to its final resting place, even more so. When I heard that Shuttle Endeavour was coming to Los Angeles to become part of the California Science Center, I knew that I’d have to see it. As a pilot, I was hoping I could see it from the air. Today, I did that. For a few weeks, we’ve known a target date (9/20/12) for the arrival of Endeavour, on the back of its specially modified Boeing 747 Shuttle Carrier into LAX. With that news, the planning started – carve out time on my schedule, think about where to be for the arrival, etc. It was only in the last few days that the TFR associated with the arrival was released. Hmm… while the TFR was a 30nm radius like the presidential TFRs, it seemed to not restrict flight above 5000′ MSL. Flight below that altitude only seemed to allow planned arrivals into or out of local airports and not to really allow “loitering”. Now, of course these things never go as planned. First, the day of the arrival was pushed back a day, as a result of weather in Florida. So much for the day I had carved out – it was now in conflict with a first lesson for a new student. Second, the day before, the arrival time and TFR gets pushed back a further hour as a result of fog in San Francisco. I worked out to have my new student accompany me on the flight and then start our lesson as soon as we were able to get back into El Monte (she’s a JPLer and seemed excited about the opportunity). I hatched my plan to depart El Monte before the TFR started and then climb away from, and then above the TFR, while staying clear of all Bravo and Charlie airspaces. I knew that Griffith Park, JPL, downtown L.A.and the Hollywood sign were all planned fly-bys. The TFR lateral boundaries extended 30nm from the LAX VOR; that’s pretty close to the ring charted for mode C transponder requirements. It meant that I’d need to get 8nm northeast of El Monte to be out of the TFR or be above 5000′ MSL.The TFR was scheduled to run from 1130 local to 1430 local. From the information available, it seemed likely that Endeavour would arrive from the west around 1130 and be on the ground at LAX well ahead of the end of the TFR. The briefing I received seemed to indicate that I’d need to get a squawk code on the ground to be able to enter the TFR back to El Monte and to be on a filed VFR flight plan. I filed a flight plan from POC (just outside of the TFR) to EMT, so I could land at Brackett if needed to get back into El Monte. Melissa and I planned to depart no later than 1115 and climb northeast to get above 5000′ MSL. Once above, we turned back west bound towards the Rose Bowl, Burbank, and JPL. I dialed in a few SoCal frequencies to the west (134.2 and 124.6) in the hope I’d hear radio chatter that would let me know it was coming. I also monitored 135.05, which would be the frequency for SoCal in the area as I loitered around waiting for the arrival of Endeavour. I’m lucky that I have TIS (Traffic Information System) in my plane and that it seems to work well in the Los Angeles basin. There were constantly 2 or 3 other aircraft within 2-4 nm of me and 1000′ of altitude, so I was always looking for other planes I knew were close by. We all seemed to be making lazy circles in the sky waiting for Endeavour. I would go eastbound at 5500′ until east of JPL, then turn back west along the mountains, climbing to 6500′ and go until I was just a little west of Burbank and then descend back east along the 134, repeat. This would allow me to spot Endeavour at any one of several planned points. Eventually, I heard a reference or two on the radio to what I think was “NASA Heavy”. 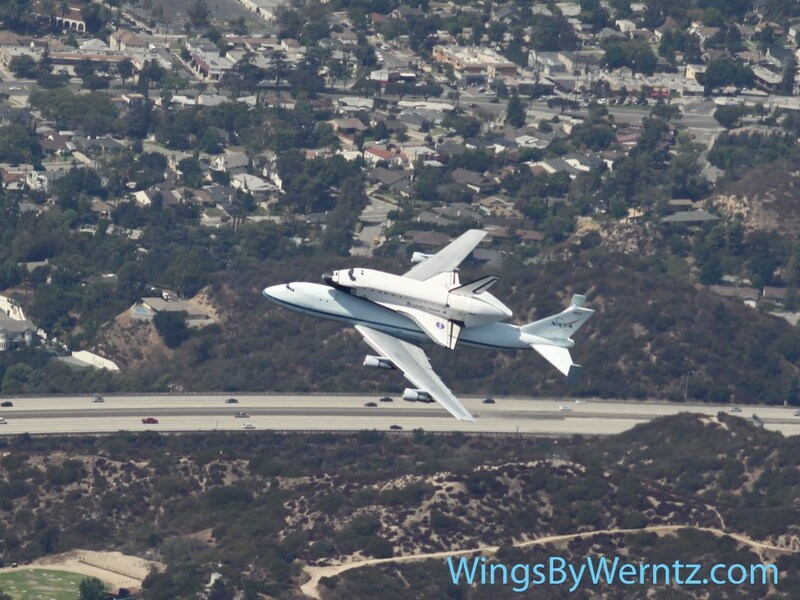 As I was turning back to the east, I spotted them over Griffith Park and continued my turn as they also turned east. I saw them fly by the Hollywood sign, over Dodger stadium and downtown L.A. and eventually over JPL and the Verdugo mountains before heading south and east towards Disneyland and Long Beach. I gave chase with full throttle, but my 180hp 172 was no match even for that aerodynamically challenged 747 and its (F/A-18?) chase planes.We kept them in sight as I approach the 60/57 interchange and were finally outside the lateral boundaries of the TFR. I called SoCal, explained my situation and desire to get back into El Monte. They gave me a squawk code and I was cleared into the TFR and direct back to El Monte at 1230. I was amazed how close I was actually able to be and how good the views were. The pictures I took were nice, though they didn’t match what I saw with my own eyes. I’m planning to be there on the ground when Endeavour travels at 2mph from LAX to its final home. This entry was posted in Opinion, Trip reports by dgwerntz. Bookmark the permalink.